It almost looks like a tree with a single bark like trunk. 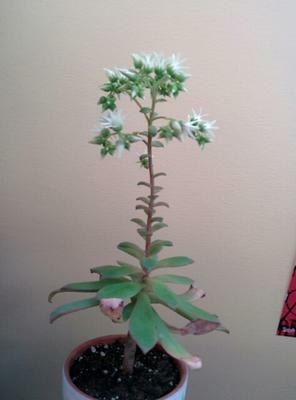 Tall, has white flowers, and the bottom leaves die as it grows. Comments for a tree like succulent? This is a typical growth habit for many Echeveria. The lower leaves will die off due to lack of light as they age. The long bloom stalk will finish producing flowers and you can cut it off at the base once that happens. Eventually, the plant itself will look like a palm tree, so it's good to 'behead' it to get a new nice looking rosette, but I would wait until it's finished flowering, so you can enjoy that while it's blooming. They bloom only once a year typically, depending on the variety and species. You can see more about cultivating this beautiful genus here. This is an Aeonium, not an Echeveria. As there are no pups at the base (that would live on), this stalk will die after it's finished blooming. Thanks for the correction, Rosemary! These two closely related plants look so similar in some cases that they're hard to tell apart. This isn't an Aeonium though, I'm pretty sure.